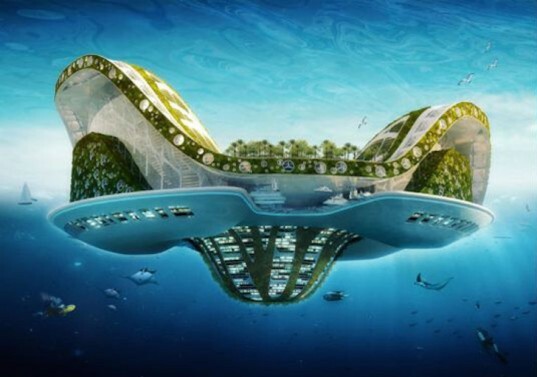 Floating cities may seem like utopian sci-fi, but autonomous ocean settlements could become reality as early as 2020, says The Seasteading Institute. The forward-thinking organization recently launched the Floating City Project—an architectural design contest that seeks innovative designs for sustainable floating cities. Seasteaders posit that these aquatic communities could be the solutions to many societal issues, such as overpopulation and threats of rising sea levels. In honor of this new ocean frontier and the ambitious design contest, we’ve rounded up seven incredible eco-friendly floating city designs that we could call home someday soon . As the world’s most populous nation, China has serious concerns about overcrowding in its cities. Chinese construction firm CCCC commissioned AT Design Office to create an attractive floating city solution that took the form of a sprawling buoyant landmass made from prefabricated hexagonal modules. 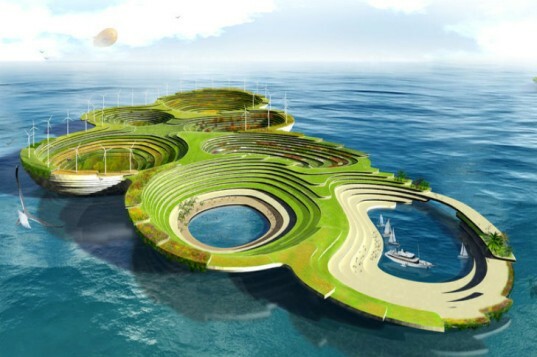 The self-sufficient island is designed to be zero-carbon, energy efficient, and would include vertical farms and fish hatcheries to produce its own food. Serbian designers Aleksandar Joksimovic and Jelena Nikolic took home an honorable mention in the 2012 eVolo Skyscraper Competition for their design of Noah’s Ark, a self-sustaining floating city designed for a post-apocalyptic world. Powered by renewable energy such as solar and tidal, the structure comprises multiple ring-shaped landmasses with agricultural fields that terrace into a water-collecting center. X SEA TY is a lush floating city designed by X-TU that cleans the air with carbon-absorbing technologies. Its hive-inspired buildings would be built from porous concrete overlaid with living walls covered with photosynthetic algae. 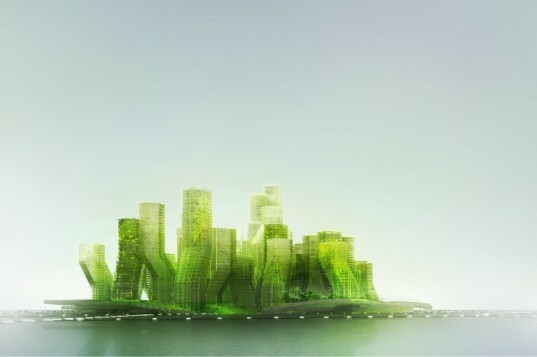 Those algae systems would produce biofuel energy to power the self-sufficient floating city. 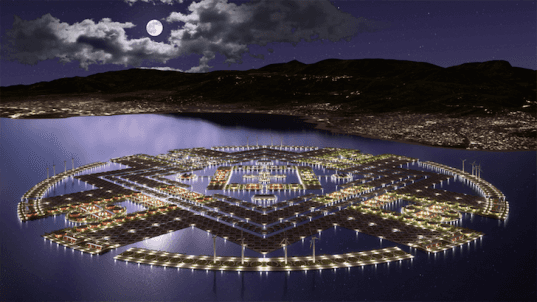 When Haiti was hit by the devastating 2010 earthquake, architect E. Kevin Schopfer and Tangram 3DS developed an innovative floating city design to bolster the country’s recovery. The collection of artificial islands, called Harvest City, envisioned a new Haiti made up of tethered floating modules. The center of the floating city would be dedicated to urban functions like office space, education, and light industry, while the outer areas comprised agricultural lands. 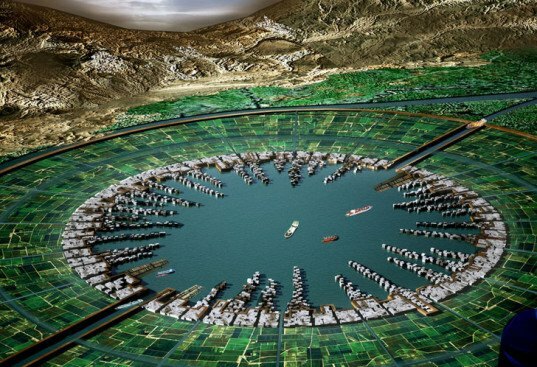 Vincent Callebaut’s Lilypad is perhaps the most beautiful floating city proposal we’ve ever seen. Created in the shape of a water lily, each of these zero-emission floating communities could house approximately 50,000 people in its mixed-terrain landscape. The self-sufficient Lilypad is powered with renewable energy and is envisioned as the future home for climate change refugees. Before Shimizu Corporation created its incredible designs for a seabed-powered underwater city, the Japanese firm had unveiled plans for Green Float—a self-sufficient floating ecotopia. Designed to house 1 million people, the floating city comprises a series of connected modular islands. A 1,000-meter-tall mixed-use eco-skyscraper is located at the center of each island and houses a vertical farm, as well as residential, commercial, and office spaces. A student architecture team proposed Silt Lake City; a floating “hydropolis” with a focus on flood control in the Nile Valley. Located on Lake Nasser, one of the largest man-made lakes in the world, the competition-winning project proposes dividing the water body into floating modular cities that could “ride” the tides during flood season. The cities would include agriculture, residences, businesses, and energy generators. Floating cities are entirely feasible. In fact, independent floating city states would be a logical extension of this concept. Commerce-driven, high-tech floating hubs for like-minded people, making a new start. Whatever form these floating cities will take, vertical concrete slipform construction will be integral to realizing these visions of self-sustaining floating habitats. For details on slipforming, see http://www.slipform.us For now, these are just pretty pictures. Engineers will turn them into reality. First, we have to teach ourselve not to pollute. Otherwise, floating cities will have an even more negative impact on our environment. Look at the current "floating" cities in the world... none are pretty. Maybe in 300 years from now after our self destruction perhaps we\\\'ve learned by then to be worthy of something beautiful and sustainable as this. Prefab self-sustaining floating city by AT Design Office As the world’s most populous nation, China has serious concerns about overcrowding in its cities. Chinese construction firm CCCC commissioned AT Design Office to create an attractive floating city solution that took the form of a sprawling buoyant landmass made from prefabricated hexagonal modules. 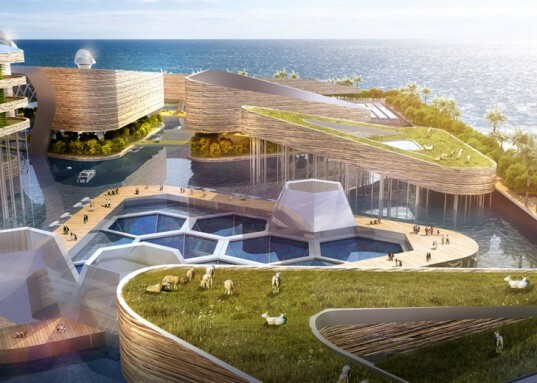 The self-sufficient island is designed to be zero-carbon, energy efficient, and would include vertical farms and fish hatcheries to produce its own food. Noah’s Ark by Aleksandar Joksimovic and Jelena Nikolic Serbian designers Aleksandar Joksimovic and Jelena Nikolic took home an honorable mention in the 2012 eVolo Skyscraper Competition for their design of Noah’s Ark, a self-sustaining floating city designed for a post-apocalyptic world. Powered by renewable energy such as solar and tidal, the structure comprises multiple ring-shaped landmasses with agricultural fields that terrace into a water-collecting center. X SEA TY by X-TU X SEA TY is a lush floating city designed by X-TU that cleans the air with carbon-absorbing technologies. Its hive-inspired buildings would be built from porous concrete overlaid with living walls covered with photosynthetic algae. Those algae systems would produce biofuel energy to power the self-sufficient floating city. Harvest City by Tangram 3DS and E. Kevin Schopfer When Haiti was hit by the devastating 2010 earthquake, architect E. Kevin Schopfer and Tangram 3DS developed an innovative floating city design to bolster the country’s recovery. The collection of artificial islands, called Harvest City, envisioned a new Haiti made up of tethered floating modules. The center of the floating city would be dedicated to urban functions like office space, education, and light industry, while the outer areas comprised agricultural lands. The Lilypad by Vincent Callebaut Vincent Callebaut’s Lilypad is perhaps the most beautiful floating city proposal we’ve ever seen. Created in the shape of a water lily, each of these zero-emission floating communities could house approximately 50,000 people in its mixed-terrain landscape. The self-sufficient Lilypad is powered with renewable energy and is envisioned as the future home for climate change refugees. Green Float by Shimizu Corporation Before Shimizu Corporation created its incredible designs for a seabed-powered underwater city, the Japanese firm had unveiled plans for Green Float, a self-sufficient floating ecotopia. Designed to house 1 million people, the floating city comprises a series of connected modular islands. 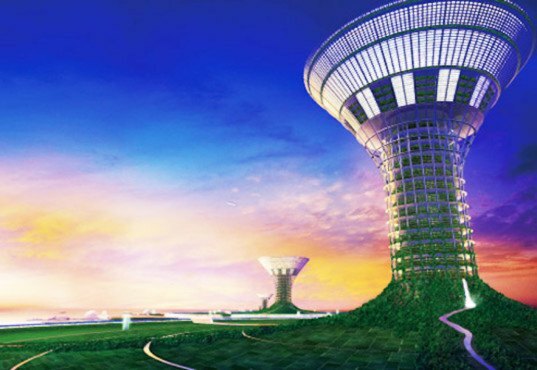 A 1,000-meter-tall mixed-use eco-skyscraper is located at the center of each island and houses a vertical farm, residential, commercial, and office space. Silt Lake City by Margaux Leycuras, Marion Ottmann and Anne-Hina Mallette A student architecture team proposed Silt Lake City, a floating ‘hydropolis' with a focus on flood control in the Nile Valley. Located on Lake Nasser, one of the largest man-made lakes in the world, the competition-winning project proposes dividing the water body into floating modular cities that could “ride” the tides during flood season. The cities would include agriculture, residences, businesses, and energy generators.